Jiří Brož has been an attorney-at-law since 2004. He graduated from the Faculty of Law at Charles University in Prague. He is mainly responsible for the management of law teams dealing with public law, focusing mainly on public procurement and subsidies, and law teams dealing with commercial law, law of information technology, real estate law, construction law, sports law and debts enforcement. Jiří Brož is also a member of the Council of Arbitrators of the Football Association of the Czech Republic. Petr Sedlatý has been an attorney-at-law since 2011. He studied at the Faculty of Law at Charles University in Prague and University of West Bohemia in Pilsen. 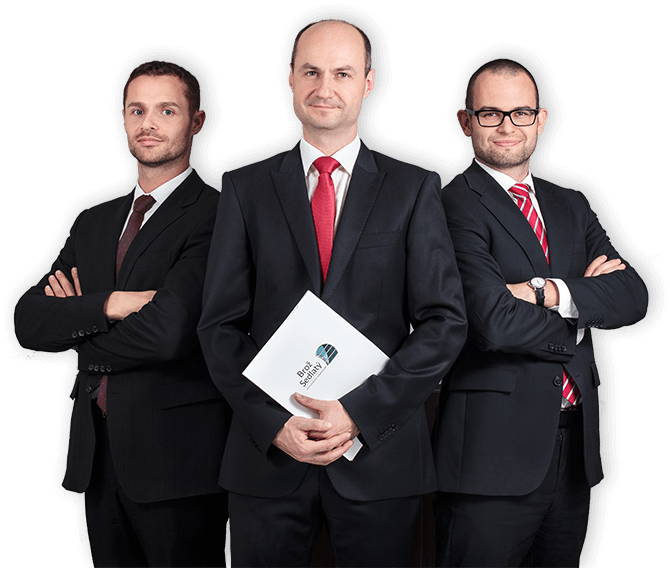 He is mainly responsible for the management of law teams dealing with commercial law, focusing mainly on mergers and acquisitions and corporate law, and the teams dealing with real estate law, construction law, sports law, insolvency law and civil agenda. Further he deals with the matters related to the internal functioning of the law firm and with execution of the statutory body duties. Petr Sedlatý is also registered in the List of Arbitrators of the Arbitration Court attached to the Czech Chamber of Commerce and the Agricultural Chamber of the Czech Republic and he is a member of the Legislative Commission of the Czech Volleyball Federation.